This is neither trendy or hip, but true and native Vienna! 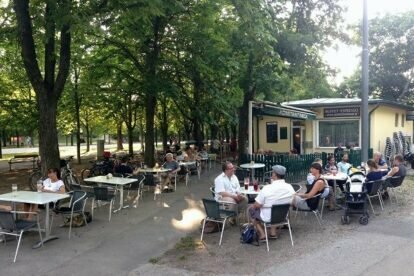 The outdoor cafe/snack bar Zum Konstantineck is located in the beautiful huge Prater park and for me, as I live around the corner, a perfect spot to relax and snack under chestnut trees. Beside the so-called “espresso” the car-free alley called Prater Hauptallee shows the Viennese hodgepodge: joggers, tourists on bicycles, retired workers with their dogs, young bohemian families with outrageously expensive prams. Konstantineck offers simple cuisine e.g. traditional bread and spread, soups, homemade cakes, so with the mixed crowd of guests you get a very good idea of “real Vienna”. Inside there are only 2 or 3 tables, so even on the rare days when it is open in winter it is nicer to stay outside. You can warm yourself with hot spiced wine a the barrels around the fire, where you’ll also find maronis being roasted. I think the nicest time to plan your rest in Konstantineck is on a hot summer afternoon to enjoy the shade. Or with some “Spritzer” on an early mellow evening with all the outdoor lights on. In autumn all the trees change colour and the last warm rays of sunlight will cast an enchanting light on this simple but charming cafe.